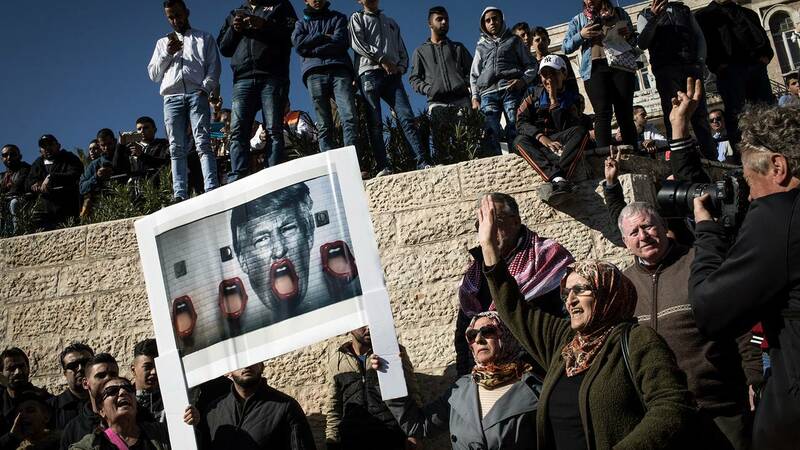 Palestinians hold a poster of President Trump as they protest outside the Damascus Gate of the Old City after Friday prayer on December 8, 2017 in Jerusalem, Israel. (CNN) - Rejecting the Americans as a possible broker in a Middle East peace process, Palestinian leaders have shifted tactics, aiming for the United Nations to nullify President Donald Trump's recognition of Jerusalem as the capital of Israel, while simultaneously trying to get other countries to recognize a Palestinian state. A UN Security Council resolution trying to annul Trump's announcement, introduced by Egypt, could be put to a vote early this week, according to Israeli officials, though the United States will almost certainly veto the resolution. That vote could come as early as Monday. Speaking last week in Istanbul following an emergency meeting of the Organization of Islamic Cooperation (OIC), Turkish President Recep Tayyip Erdogan made it clear that many Muslim countries no longer view the Americans as an honest broker in any peace process. "We are starting initiatives at the UN to nullify America's decision on Jerusalem," Erdogan said. If, as expected, the resolution doesn't pass at the Security Council, Erdogan, echoed by Palestinian leaders, said he would pursue a similar resolution in the United Nations General Assembly, where a simple majority would allow a non-binding resolution to pass. Even if a General Assembly resolution is non-binding, its potential passage would show overwhelming consensus in opposition to Trump. Israel's Ambassador to the United Nations, Danny Danon, slammed the proposed resolution. "The Palestinians are continuing to try to rewrite history. No vote or discussion will change the clear reality -- Jerusalem has been the capital of Israel forever. We will continue to struggle for the historic truth, and this time, together with our allies," Danon said, alluding to the Americans. U.S. Ambassador to the United Nations Nikki Haley remains one of the most popular Trump administration figures in Israel for her defense of the country and her attacks on Iran. Though other nations have volunteered to host peace negotiations, there has never been a true alternative to the United States. President Jimmy Carter stood between Egyptian President Anwar Sadat and Israeli Prime Minister Menachem Begin when the two countries signed their 1979 peace agreement. Bill Clinton was on hand for the signing of the Oslo Accords in in 1993 between Palestinian leader Yasser Arafat and Israeli Prime Minister Yitzhak Rabin. A year later, Clinton was there again as Rabin signed a peace treaty with Jordanian King Hussein. By contrast, a French initiative fizzled last year into promises of economic incentive packages for both sides. Russian President Vladimir Putin offered to host the Israeli and Palestinian leaders in Moscow last year, though his proposal may have been more a jab at former President Barack Obama, whose popularity in Israel was crashing. Despite many Muslim states rejecting the Trump administration as an honest broker of peace, the White House insists they are still pursing what Trump has dubbed "the ultimate deal," a final status agreement between Israelis and Palestinians. On Friday, the White House, which has so far kept mum about its peace plan, gave the slightest hint to its formulation when a senior administration official said, "We cannot envision any situation under which the Western Wall would not be part of Israel. But as the President said, the specific boundaries of sovereignty of Israel are going to be part of the final status agreement." The statement was met with incredulity by Palestinian leaders. A spokesman for Palestinian Authority President Mahmoud Abbas said, "This American position proves once again that the current U.S. administration is completely out of the peace process." Nabil Abu Rudeineh said the Palestinians would not accept any changes to the 1967 border, the green line that delineates East and West Jerusalem. The Old City of Jerusalem -- including the sites holy to the three Abrahamic faiths -- sits in East Jerusalem. Previous negotiations have seen the sides accept -- in principle -- the idea of mutually accepted land swaps. The Israeli settlement blocs in the West Bank would be incorporated into Israel; in exchange, the Palestinians would receive land that is currently part of Israel. The comments from Abu Rudeineh suggest a hardening of the Palestinian negotiating position, making it harder to pursue a peace process, rather than the opposite. Jerusalem has always been the most sensitive issue in the Israeli-Palestinian conflict, with every square inch considered sacred, if not for religious reasons, then for political aspirations. Palestinian leaders plan on meeting Monday night to discuss their next steps beyond the attempts to pass a United Nations resolution.